The death toll from a series of landslides and flash floods in Indonesia climbed to 19 on Wednesday (Sep 21), an official said, including several children found by rescuers scouring for survivors. The worst-hit region was the west of Indonesia's main island of Java, where torrential downpours in Garut saw floodwaters quickly rise to 2 metres (6.5 feet), national disaster agency spokesman Sutopo Purwo Nugroho said in a statement. "The official report (from Garut) ... is that 16 people were killed and eight others are still missing," he said. Among the dead from the fast-rising floods were an eight-month-old toddler and four other children under the age of ten, Sutopo added, citing a casualty report from the local disaster agency in Garut. More than one thousand people have been forced from their homes in the district and are taking shelter in nearby emergency tents set up by search and rescue teams. The landslide left two others injured and destroyed a mosque, Sutopo added. The country's disaster agency has warned people to be alert for disasters this wet season as a La Nina weather phenomenon threatens unseasonably heavy rain. 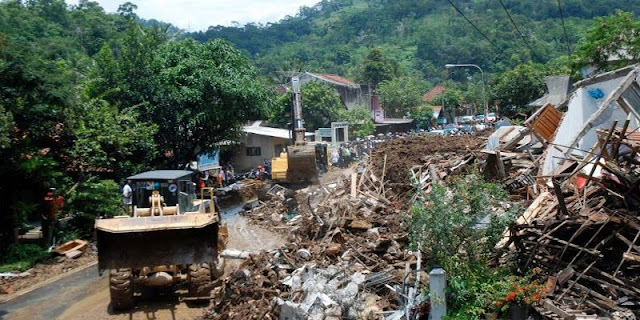 In June nearly 50 people died when heavy downpours sent torrents of water, mud and rock surging into villages in Central Java, another densely-populated province on Indonesia's main island.